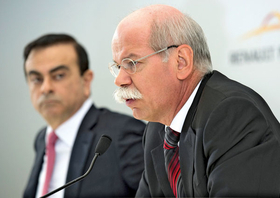 Nissan CEO Carlos Ghosn, left, and Daimler CEO Dieter Zetsche, plan to discuss more collaborative efforts on Wednesday. FRANKFURT -- Daimler AG is considering sharing its small-car platform with Nissan Motor Co.'s Infiniti brand, two people familiar with the situation said. The potential to expand cooperation between Infiniti and the German company's Mercedes-Benz division may be discussed Wednesday at a joint press conference by Daimler Chief Executive Officer Dieter Zetsche and Nissan CEO Carlos Ghosn, the people said, speaking on condition of anonymity because the talks are private. The executives are meeting journalists at the International Motor Show in Frankfurt to discuss projects that Daimler plans with the alliance of Nissan and Renault SA, the French carmaker that Ghosn also heads. The tie-up, which the companies announced in April 2010, could lower the costs of models they're developing for the low-margin compact segment. Small cars have become increasingly important for upscale automakers to attract urban customers and meet demands from regulators to lower fuel burn of their vehicles. Daimler set up the partnership with Renault-Nissan to enable expansion in the segment, especially to develop models for the German company's Smart city-car brand along with Twingo vehicles built by Boulogne-Billancourt-based Renault. Mercedes-Benz is using the Frankfurt show to introduce a new version of the B-Class, the first in a line of five compacts underpinning the manufacturer's effort to retake the luxury-car industry lead from BMW AG. All five models will share the same front-wheel-drive platform. Under the original agreement, cooperation between Mercedes- Benz and Infiniti was limited to supplying the Japanese luxury- car manufacturer with diesel and gasoline engines. Editor's note: An earlier version of this story gave the wrong day for a possible Daimler-Nissan press conference. It may take place Wednesday, Sept. 14.